On a cold winter day in the midst of the Depression, the hardworking wife of a farmer and Primitive Baptist preacher in South Georgia gave birth to her 11th child, a daughter named Faye. Money was scarce, times were hard, and from the moment she could walk, Faye worked, doing whatever it took to keep the ninety-acre farm going. No one could have predicted that this little girl would grow up to be the first woman attorney in the county, the first woman appointed to the Georgia Superior Court bench, and the first woman chief superior court judge in Georgia. In the rural South of the 1930s, most little girls were fated to be wives and mothers. But despite Faye's preferences for boyish activities, she was greatly influenced by her mother. Though her mother, Addie Lou, was relatively unedu-cated, and was married when she was only 13 years old, she had a deep respect for school, and she urged young Faye to keep up with her homework as well as her chores. Imbued with her mother's regard for learning, Faye Sanders never missed a day of school. Once Faye was graduated and had taken a job as a sec-retary with a local attorney, she realized she wanted more out of life. Thus began a journey that would take her to law school, a law partnership and, eventually, a Superior Court bench. 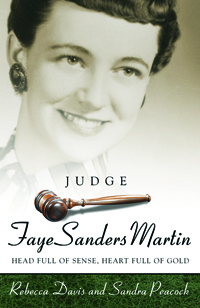 This biography focuses on the life and times of a woman who overcame the initial obstacles of gender and poverty and the later challenges of alcoholism to become the first woman attorney in Bulloch County, the first woman appointed to the Georgia Superior Court bench, the first woman chief superior court judge in Georgia, and the first mother to swear in her own daughter as an attorney in Georgia.